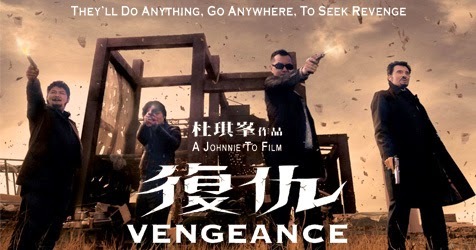 Saw Johnnie To’s 2009 Cannes competition film "Vengeance" last night and I was completely enthralled again by how the master director hooks his audience to the story that he wants to tell until he sets you free with another unexpected finale – actually, the unpredictability of his narrative is almost predictable already. And don’t consider it a criticism; it’s just an observation coming from an awe-struck fan. This is only the 2nd film that I have seen from the director and I now consider myself a super fan. I first saw his "Drug War" two weeks ago on DVD and that one was so impressive that I watched it twice in one night! Johnnie has this uncanny ability that only a few masters are able to do: He can set the tone of the movie by the very first minute! It’s amazing! "Drug War" is the more superior film between the two but "Vengeance" is by no means a lesser film. It’s a suspense-thriller filled with spectacular action set pieces and enigmatic performances. The main plot is about a father trying to avenge the murder of his son-in-law and his two grandchildren upon the request of his severely paralyzed daughter. He hires a group of assassins to locate the killers and determine the mastermind behind the hit but there’s a minor problem: He has a bullet lodged in his brain from a shootout twenty years earlier that’s causing him to lose his short-term memory. The action sequences are impressively choreographed specially the nighttime shootout between his hired assassins and the killers he was after. The fight is like a ballet held in a forest with the moonlight and the shadows of the trees and the fleeting flame ignitions from gunfire completing the dramatic vista. I am not very familiar with the French actor Johnny Holiday but his presence and performance along with another of Anthony Wong’s indelible characterizations provide the movie’s weightiest points. Rent it. Buy it. Stream it. Watch it.